Disclosure: I received a copy of Sight Reading from Harper, an imprint of Harper Collins Publishers. My opinion and thoughts about the book are my own, and I was not paid to write this post. This week I read Sight Reading by Daphne Kalotay. I've been looking forward to its release because I loved her first novel Russian Winter. You may read my post about Russian Winter here. 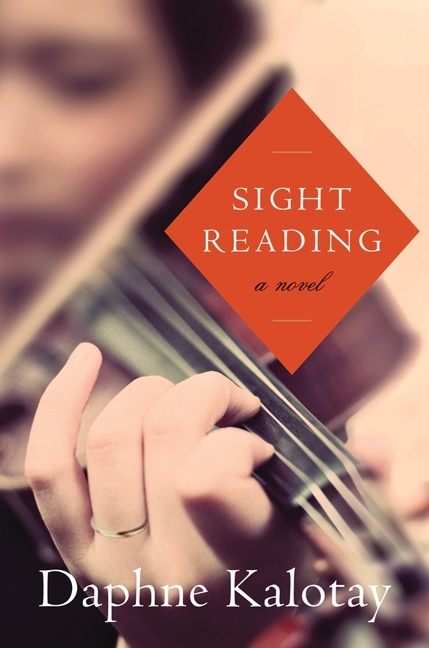 Sight Reading is a lyrical story of family, betrayal, and yearning set in the world of a classical music conservatory. The book includes a handy musical terminology glossary as well as a playlist on Kalotay's website. I suggest listening to the playlist while reading the novel. "Even the grandest lives come down to a few people and places. Loved ones, your daily work, your neighborhood....I've been realizing that lately. How complete our lives can be with just the few people and activities you most love." Although the woman scorned, Hazel is the most well-defined character. It takes her a long time, but she finally "gets it" in the end and lives her life according to Yoni's wisdom. She builds a life of beauty in the small details of her daily life while also giving other artisans an opportunity to sell their creations. In music, sight reading means performing music from a score without having seen the score before. Having the second sight means perceiving things that aren't apparent to most people. Hazel has this second sight, but she doesn't trust it. She sees her doppelgänger on two different occasions, and she has visions. The book is divided into three sections, and all three represent aspects of Hazel's gift. Nicholas is the least defined main character, and he has abandonment issues. He suffered a childhood trauma that has made him aloof and disengaged, the direct opposite of Remy and her sensitivity to others and their needs. He has been composing an orchestra for years inspired by his Scottish childhood, and he can't seem to finish it; yet he has no problems writing scores for movies and completing other commissions. Ironically Nicholas peaked very young, and Hazel is just coming into her own in her early fifties. I enjoyed this book so much and not just because of its focus on music. It's a family drama about divorced parents with joint custody attempting to rear a daughter amicably. The characters harbor deep, dark secrets, and some of them are quite shocking. There is an element of magic in it (even a leitmotif of Gypsy music) and the unexplained. But my favorite element of the book is the creative process and what it truly means to be an artist. Remy's tutor at the conservatory teaches her that "the practice is the performance." I couldn't agree more! I have not book to link up. Though I just told my daughter time to head to the bookstore for my summer reads. But I just love your header. That sounds very engaging- thanks! It's on my list now. I love the juxtaposition of sight reading and the second sight. Sight reading it itself if a skill that requires self-confidence, calm, and aptitude with your instrument, which it sounds like is Hazel's journey with life. A book that can accurately portray the truth of the creative process, while maintaining mystery and allure....that's pretty rare! You always seem to find great books! I have missed reading your posts after some time away but glad to get back. Missed ya!! We are here in the mountains now and I've already been to the library. I picked up a book by a favorite author, 'The Child's Child' by Barbara Vine. I know it will be good! Sweet hugs!